Even the most diligent primitive puppy raiser can do everything right and still end up with a shy or fearful puppy. Today most advice regarding puppy raising is socialize, socialize, socialize, but that doesn’t work for every puppy. Some puppies respond the direct opposite of all the manuals. They flee from strangers, growl at other dogs, and duck being touched. This doesn’t mean you have a messed up puppy or will have a broken dog. There are still lots of ways to help your puppy become accustomed to the world. First - SLOW DOWN! Check what kind of interactions you are exposing your puppy to. If you live alone and then take your puppy to street fairs where 100 hands are on them in a half hour, that is in fact, too much socialization. Slow things down and make sure that your puppy isn’t rightfully overwhelmed. Support, don’t smother. If your puppy isn’t comfortable, don’t force them to interact. Instead just be present around people without forcing your puppy to say hi or even watch. Outside public libraries is my favorite place to practice this. Most people will pay no attention to your puppy but a few might and they will usually allow your puppy to take their time saying hi. Most are not even insulted if your puppy isn’t feeling up for it that day. Sometimes even other puppies can be overwhelming like this one on the left is. Limit human and canine contact by reading your puppy’s body language. Cease contact when your puppy lip licks, yawns, head turns, or otherwise attempts to disengage. My own Shiba puppy Saga hated physical petting as a puppy until I stopped all contact after 3-4 seconds and let her ask for more. After a month or so of this she learned to love contact and is obsessed with being pet today. Try to limit puppy play and focus on calm adult interactions. 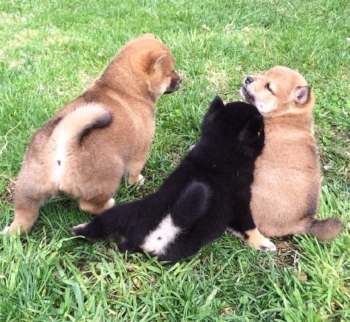 Rambunctious puppy play can be very overwhelming for little primitive puppies. Calm adults can still play and remind puppies of boundaries. Don’t mix puppies with dogs that give harsh or violent corrections or this can further frighten the puppy. If your puppy is sound sensitive, play noises through your tv or phone while they are eating or sleeping. During play or chewing time is fine as well as long as the puppy doesn’t then try to investigate or flee. We want them to stay in one place and learn to ignore it. Don’t play the noise right next to the puppy but instead a few feet all the way up to a few rooms away. It should be subtle and not startle the puppy. Shinra is a lovely teacher and babysitter but we still never leave him alone with a puppy. Avoid chaotic locations like dog parks, playgrounds and daycares. While these locations can be fine for older dogs and mature puppies, they can quickly overwhelm and frighten a shy puppy. Limit interactions with children for 10-20 seconds with short breaks, especially if the children are rambunctious. And finally remember that children and other dogs are not your puppy’s babysitter. Crate or gate your puppy away if you can’t watch social interactions. Looking for more suggestions? Our community is here to help! Stop in and share your puppy with us today!